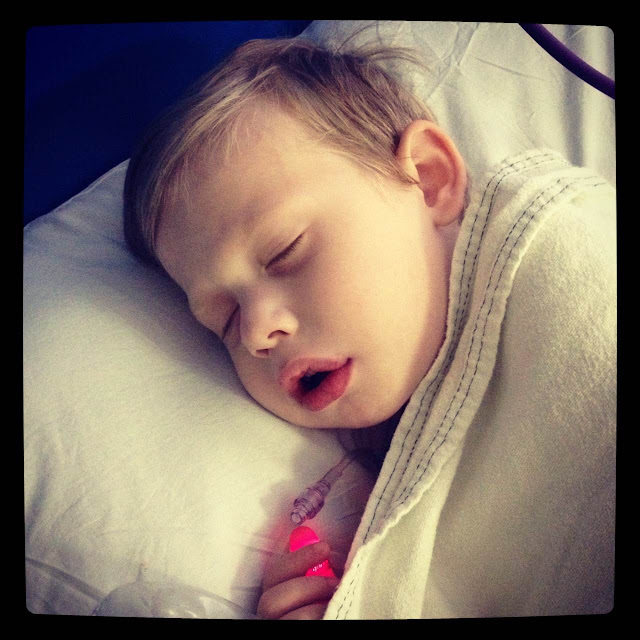 Bennett Brinson Gamel: Fighting Cystic Fibrosis: Admitted after all. Anesthesiologist decided to admit Bennett after all. Bennett is now in his room. I am lying in his crib-bed holding while he sleeps and I watch Cars 2 for the 100th time. But he's comfortable. On one hand, we were disappointed he had to be admitted but the anesthesiologist wants to monitor his breathing because he was under anesthesia for 4 hours. In addition, he may need extra pain medication for all of the procedures he went through today. On the other hand, I'm really glad to have an admission. It will help him recover under supervision and will allow me to be mom for the next 24 hours, rather than nurse. Will post more details later but he is doing well...just sorta annoyed the he doesn't feel well. My little one, Bennett, is in the fight of his life.